Yesterday was lots of fun with the trunk show from Joanie & Kelsey Morrow from The Stitchery in Olds. Jo came too, and it was a good time. 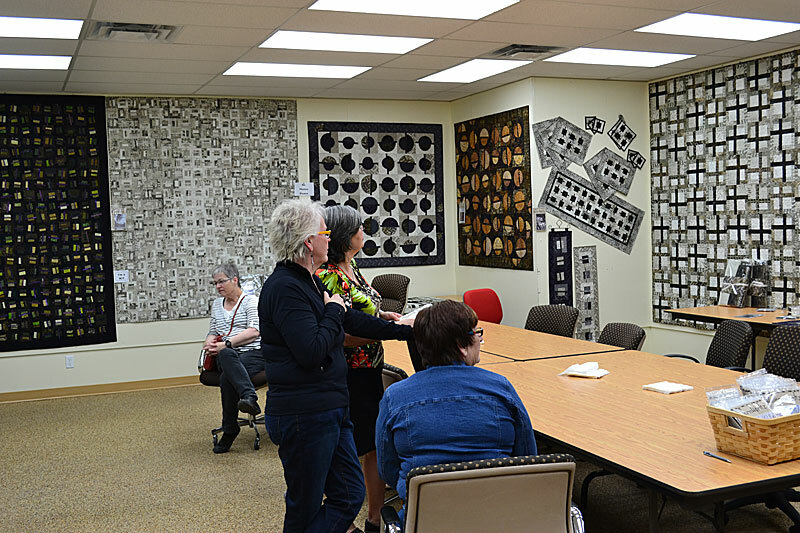 It was wonderful to see the patterns they designed, and the quilts they made with Joanie’s new line of fabrics called Double Vision from Cantik Batiks and Andover Fabrics (we carry the entire line of both the batiks and printed cottons). Everyone loved Kelsey’s quilting! When there was a lull in the crowd, I managed to take a few pictures for those of you who couldn’t attend. 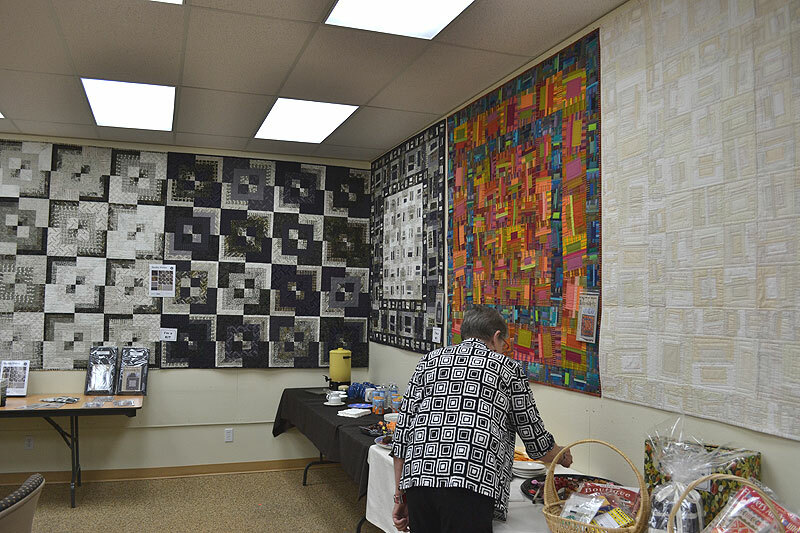 Come in to meet Joanie & Kelsey Morrow from The Stitchery in Olds who will be displaying their patterns and quilts, most made with “Double Vision” – a line of batik and printed cottons designed by Joanie herself! Enter for door prizes, including a fat quarter bundle of Joanie’s entire “Double Vision” line (retail value of $179.55). Refreshments and yummies will be served. All sharpening charges are directly through Ralph, and he is giving a 10% discount for this day. He accepts cash, cheques, or Visa. We have a new kit available! Click the picture to see it on our webstore. If you are following Along Came Quilting on Facebook, you might have noticed that my postings are not ending up in your Newsfeed very often – if at all. And while the postings might show up in your Pages Feed they are not shown for long (about 7 days is what I can see). Recently, the number of our Facebook fans viewing our posts has drastically decreased. This is rather concerning for me, when I know you’d like to keep current. Since Facebook is moving more and more away from showing you the stuff you subscribed to see, I want to let you know how to ensure you don’t miss out. Firstly, I will be making most of my postings to Facebook now through this blog. In the past, I used the blog to post more lengthy material and for things I’d like to ensure stay available for reading. But most everything will now be posted on the blog, which in turn publishes automatically on Facebook. Here’s the trick for you: Subscribe to the blog itself. You will get the blog post directly in your email and you won’t miss out. To subscribe, go to the blog, and you will find the Email Subscription box underneath the banner picture. Secondly, if you don’t want to subscribe to the blog, you can be notified when there is a new Facebook post. Go to our Facebook page, click the pull-down arrow next to “Liked”, and click on “Get Notifications”. This will ensure you are notified when a post has been made on our page. You will need to go to Pages Feed to see the post. Thirdly, by commenting or liking one of our posts on Facebook, you will be a little more likely to receive it in your Newsfeed. (But I don’t think this will be a forever thing; the rumour mill is that Facebook will be taking Pages’ posts out of your Newsfeed entirely in time (unless they are paid to put it there by the business). And finally, I send out Newsletter emails to our customers. They do not cover the little things like funny videos, great recipes, customer’s quilt pictures and such, but instead are the more “formal” informational side of the business. To subscribe for the Newsletters, please go to our home page and look for the “Join Our Mailing List” on the right hand side and fill out the boxes. Ahh technology, there’s always more than one way to stay in touch. Facebook should take note.